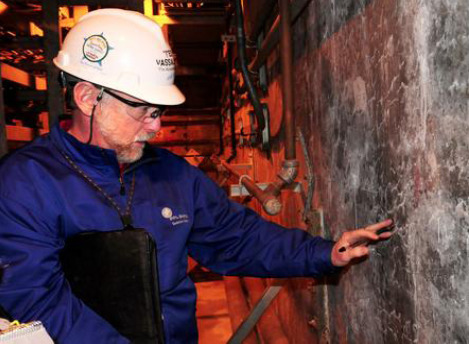 One of the issues that has complicated the license renewal process at the Seabrook nuclear plant in New Hampshire is the discovery of potentially serious concrete degradation in some of the buildings. This problem was first officially noted a year ago, when NRC inspectors confirmed that widespread cracks in the plant’s concrete due to a process called alkali-silica reaction (ASR) resulted in a “moderate to severe” reduction in concrete strength in five buildings. ASR can occur when certain forms of silica in the bulk material in concrete (such as crushed rock and sand) react in the presence of water with such chemicals as sodium or potassium, which are commonly found in the cement paste. This reaction produces a gel that forms in the pores of the concrete and then expands, causing stress and cracking. Over time, those cracks can join together to form larger fissures in the cement and compromise the concrete’s structural integrity. To better understand the technical issues related to the concrete damage, we hired a concrete expert to review the publicly available documents. Paul Brown, a professor of ceramic science and engineering at Penn State University, wrote a report that discusses the problem and identifies some outstanding questions that need to be answered. Working with the group C-10, we released his report along with a summary of the issues. Prof. Brown concluded that neither plant owner NextEra Energy nor the NRC fully understand the scope or origins of the problem and therefore cannot adequately assess the plant’s structural status. His report provides a list of key questions the NRC and NextEra Energy need to address before they can assure nearby communities they are not at heightened risk. In particular, NextEra and the NRC must determine to what extent ASR is occurring, what other negative reactions—including corrosion of embedded steel in the concrete—are occurring, and what basis there is for knowing which steps will be effective in addressing these problems. NextEra Energy applied to the NRC in 2010 for a 20-year renewal of the operating license for Seabrook. Its current license was issued in 1990 and does not expire until 2030; the license renewal would allow Seabrook to operate until 2050. NRC and NextEra analysis of the plant must therefore identify and understand aging issues well enough to predict its behavior for the next 40 years.